Green India Exports is a well-known name in the industry as a prime Coconut Husk Chips Manufacturer, Exporter and Supplier. Based in Tamil Nadu, we excel in offering Coconut Husk Chips that are resistant towards fungi and have exceptional air porosity. 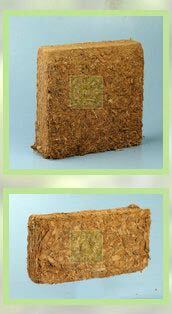 Due to their nutrient holding properties and excellent drainage, Coconut Husk Chips promise healthy growth of plants. They absorb moisture very fast and are capable of retaining it. Our Coconut Husk Chips are free from weeds and pathogens. What makes Coconut Husk Chips? Coconut husk is used for manufacturing Coconut Husk Chips. Coconut husk is the rough exterior layer of the coconut and it consists of fibre and is spongy in nature. Due to its spongy nature, the husk keeps the coconut afloat, prevents it from rotting and protects it during the process of germination as it resists excess saturation of salt. Coconut husk is used as a growing medium as it has all the properties to support the growth of plants. Coconut husks have a stable source of carbon and are highly moisture effective, as they can hold moisture up to seven times its weight. Once the coconut is de-husked, the excess fibre is separated from the husk, which is then cut in small chips. These chips are then baled. Reduces wastage of material and plants. Husk-chip sizes : The coconut husk can be cut into chips of different sizes, so as to suit the requirement of the buyer. Packaging : Coconut Husk Chips are packed and exported as compressed 5 kilogram blocks and 650 gram briquettes and palletized during shipment.